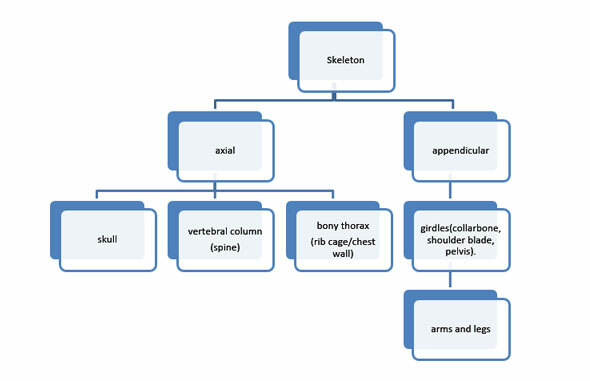 What is the purpose and structure of the skeleton? The brain is protected by the skull. The heart and lungs are protected by a strong rib cage. It is also protected by the breast bone (sternum) at the front and vertebral spinal column at the back. The spinal cord is protected by the vertebrae (bones of the spine). The intestines and reproductive organs are protected by the pelvis. 2. Supports our body through a framework of bones. are not solid. The hard outer layer of the bone protects the light, porous (not solid) bone inside. This porous bone contains the marrow, which is the factory where red blood cells are produced – a process called ‘haematopoiesis’. Red blood cells carry oxygen around the body, providing energy for our muscles. However, before we are born, all of our bones begin as a rubbery material called cartilage. As we grow, more and more deposits of calcium are laid down which change some of the cartilage into a more solid and rigid mass – bone. act as an anchor for muscles which together, along with other soft tissues, make the body move. contain calcium and other minerals which make them hard (rigid) and provide strength. supply the body with calcium when the diet is calcium deficient. 3. Prevents the body from losing its shape. 4. Suspends some of the vital organs, preventing them from crushing each other. 5. Helps keep the calcium levels in the blood constant. Calcium is essential for the functioning of all the cells in the body, in particular the bones, brain and muscles. Without enough calcium, these cells do not operate properly. The body needs a constant level of calcium. If there is not enough calcium in the blood then cells called osteoclasts dissolve calcium from the bones. The appendicular skeleton refers to your arms and legs. It is called appendicular, from “append” because they are attached by girdles, which bridge each with the main body. Bones cannot move without muscles. Most muscles (like those in our arms and legs) work in pairs – one muscle contracts as the other one relaxes. The bone is pulled towards the contracted muscle. Muscles are attached to bone by tendons. How are bones joined together? The place where two or more bones meet is called a joint. Some joints are fixed as in the skull, but others can move such as where the bones in the leg meet. (See Joints.) At these joints, ligaments hold the bones together. Bones in the body do not bend but break when abnormal pressure is placed on them. There is an exception to this and that is in a small child, called a greenstick fracture because it looks like a green rather than dry stick has tried to be broken.